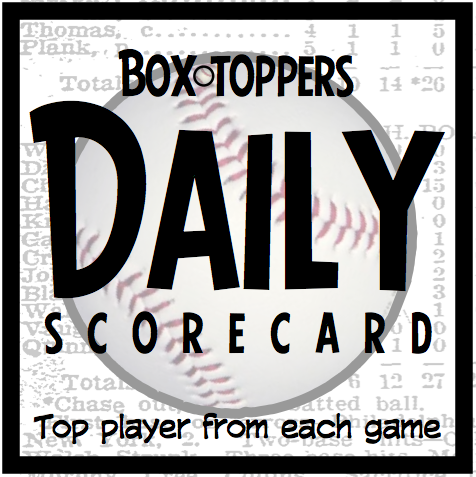 Phillies pitcher Nick Pivetta is Thursday’s Box-Toppers Player of the Day. Pivetta struck out nine over 5 2/3 scoreless innings, allowing four hits and no walks, in the 5-0 win over the Marlins. American League Player of the Day—Red Sox pitcher David Price struck out five over seven scoreless innings, allowing three hits and three walks, in the 3-2, 12-inning win over the Rays. Price picked up a no-decision and did not earn the win because the game was in a scoreless tie when he exited. Price earns 1.7 Box-Toppers points for being AL Player of the Day, giving him 113.6 career points, rising to 50th place since 1995 when Box-Toppers tracking began. With his points Thursday, he passes five players on the “all-time” list—Kevin Brown (112.8), Sammy Sosa (113.2), Dan Haren (113.2), Chris Carpenter (113.3) and Twins pitcher Ervin Santana (113.4). Price now trails 49th-ranked player Josh Beckett (114.9). In addition, Price now has 2.7 Box-Toppers points in 2018 and rises to fourth place in Box-Toppers season player rankings. National League Batter of the Day—Jay Bruce of the Mets hit a grand slam and doubled in the 8-2 win over the Nationals. Bruce went 2-for-4, scoring twice. Bruce has now earned Box-Toppers points in 11 straight seasons with his first Player of the Game honor of 2018. Bruce earned his first Box-Toppers points in 2008 with the Reds and has 70.3 career points, 168th among all players, 79th among all batters, fifth among active NL batters and second among active NL outfielders (behind Ryan Braun of the Brewers with 91.7). Bruce’s best season was 2010 with the Reds when he had 12.7 Box-Toppers points, third among NL batters. In 2017 with the Mets and Indians, he had 10.0 points, fourth among AL batters. American League Batter of the Day—Miguel Sano of the Twins hit a two-run homer and 1-for-3, in the 4-2 win over the Mariners. This is the second straight day Sano has earned AL Batter of the Day honors. Sano earned 1.5 Box-Toppers points for each of his AL Batter of the Day honors and has 3.0 Box-Toppers points on the season, rising to third place in season player rankings. Cubs pitcher Jon Lester has now earned Box-Toppers points in 13 straight seasons after earning his first Player of the Game honor of 2018 in the 8-0 win over the Brewers (6IP 3H 0R BB 6K W). Lester earned his first Box-Toppers points in 2006 with the Red Sox and now has 154.9 career points, rising to 19th among all players since 1995, when Box-Toppers tracking began. With his point Thursday, he passes Rangers pitcher Cole Hamels (154.4) and now trails 18th-ranked player, Astros pitcher Justin Verlander (155.0). Lester rises to eighth in career Box-Toppers points among active players. Lester’s best season was 2010 with the Red Sox when he had 23.4 points, first among all players. He’s had 20 or more points in one other season (2016 with the Cubs, 22.1, fourth among all players). In 2017, Lester had 10.7 points, 16th among NL pitchers. Scoring—Pivetta earns 2.0 Box-Toppers points for being Player of the Day and Price earns 1.7 points for being AL Player of the Day. Bruce and Sano each earn 1.5 points for being their league’s Batter of the Day. All of Thursday’s other Players of the Game (listed in the chart below) earn 1.0 Box-Toppers point.